We celebrated Blessing of the Animals at Grace on September 29, for logistical reasons. It was especially poignant for me because for the first time, we didn’t bring any of our living cats with us. Instead, I brought the ashes of Maggie Pie, who died in 2003, and Margery Kempe, who died on New Year’s Day this year. My heart was heavy because back home Thomas Merton is sharing his last days with us. He was diagnosed with cancer two months ago. We actually thought that Merton would probably be dead by now. He’s lost weight; the tumor in his jaw has grown; but for the most part, he seems to be enjoying life. He’s become very affectionate and since he’s lost weight, he’s taken to lying between my legs which was a favorite spot of his predecessors. Coincidentally, at night he has begun sleeping where both Maggie and Margery slept the last months of their lives, up at the top of the bed between our pillows. Maggie slept there because it was a place of safety away from Merton, who tended to beat up on her. Merton sleeps there because it’s where he seems to want to be. This morning, he seemed to be in a very good mood and feeling well. 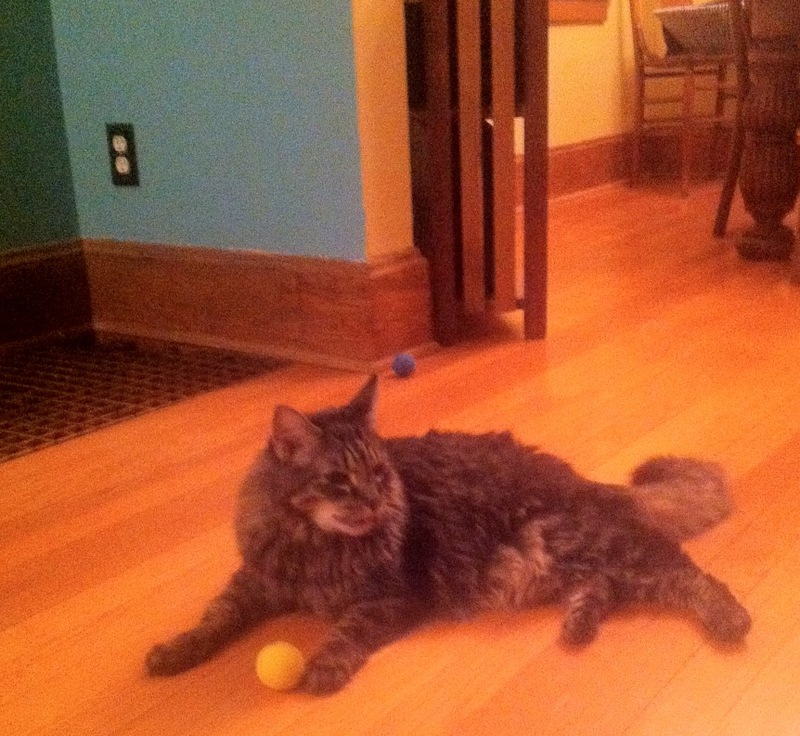 He played with his ball, even carried it in his mouth, and ran around the house. So we are facing that difficult decision so many people face. With the deep love we share for our animal companions, it is extremely difficult to watch them suffer, and as difficult to imagine life without them. But when we open our homes and our hearts to them, we also accept the responsibility of caring for them in life and in death. We accept the responsibility to release them from the pain they suffer and don’t understand. Today is our annual Blessing of the Animals, a day when we remember the witness of St. Francis of Assisi and remember to the goodness of God’s creation. For some, the Blessing of the Animals may be little more than a gimmick. For others of us, it is a way of acknowledging the relationships we have with our pets, the reality that these relationships can be deep, long-lasting, and fulfilling, and that through them, we can experience the love of God. 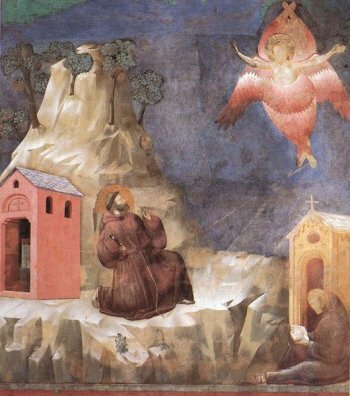 St. Francis of Assisi is among the most beloved, perhaps the most beloved of the saints. We are drawn to his simple, child-like love of Jesus Christ, his preaching to the birds, his impulsive actions in trying to make the gospel concrete for himself and those around him, his attempt to bring peace between Crusaders and Saracens. In the twenty-first century, he is revered as a proto-environmentalist. St. Francis is a model saint not only for who he was and what he did, not only because of the deep devotion he had for Jesus Christ, and for the deep devotion he has inspired in millions of Christians over the centuries. St. Francis is a model saint because he continues to challenge us to reflect on our faith, to deepen it, and to be bolder and more complete in our imitation of Jesus. His continuing “otherness” challenges us to confront our compromising attitude to the world, to our selfish desires, and our comfort. St. Francis died on this day in 1226. Specifically, he wondered why kids did the “meet me around the flagpole” thing. I don’t know if it’s still popular, but back then, in the first weeks of public school in the fall, there was a designated time when “Christians” would gather together to pray. He found it very alienating and obviously not in keeping with Jesus’ words. To watch Tim Tebow, or for that matter, any other athlete, pray after a touchdown, may be equally alienating to non-Christians. 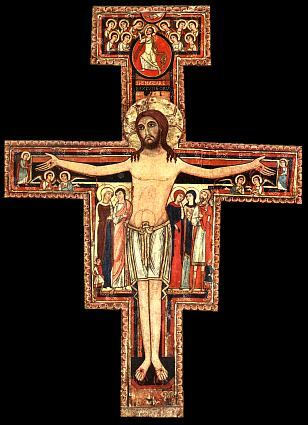 The story of Francis encountering the San Damiano crucifix wonderfully illustrates what the great Jesuit theologian and philosopher Bernard Lonergan called “the Law of the Cross.” What was that? We’re meant to look upon Jesus, as Francis did in that Umbrian chapel, and fall in love. And having fallen in love, as any lover knows, the entire world is changed. The entire post, written by Terrance W. Klein, is available here. As I wrote early this morning, our proposal was approved by the Plan Commission. Now it’s on to the Common Council. Good Evening. I am Jonathan Grieser, the rector—priest, at Grace Episcopal Church on Capitol Square. I am a member of the board of St. Francis House, and have shared in the deliberations over the future of that ministry. The proposal that comes before you is the product of three years of prayerful discernment and consultation with our neighbors. We have adapted the proposal to address Luther Memorial Church’s concerns. I believe this project deserves Plan Commission approval. It accomplishes some long-term goals of the city—in-fill development, moving student housing closer to campus. Moreover, by returning this property to the tax rolls, it will add to the city coffers in this time of fiscal challenges. I do not want to downplay LMC’s concerns about noise, congestion, and vandalism. Their concerns are common to urban churches across the country, including my own. We struggle with parking restrictions for everything from Ride the Drive to the Ironman Triathlon, with noise from protestors, parades, and Capitol Square events like Art Fair on the Square or Taste of Madison, which in addition to noise and parking, offers our worshippers smells from countless food carts. It is a rare Sunday that doesn’t bring some event or group to the Capitol. As the site for the men’s Drop-In shelter operated by Porchlight, our efforts to put our faith into action bring their own set of challenges. Urban ministry can be a challenge, but I’m sure my Lutheran colleagues would no sooner abandon their location than we would abandon ours on the corner of N. Carroll and W. Washington Ave. Whatever the challenges, the opportunities for ministry and mission are much greater. For us, those opportunities involve our neighborhood on Capitol Square; for Luther Memorial, it is the opportunity of sharing God’s word in the heart of a great university. The passionate involvement of so many LMC members in this process is proof of the vitality of that congregation and evidence of the bright future that lies ahead for it, no matter what happens tonight. None of the challenges I’ve mentioned, nor the issues raised by LMC, constitute a threat to ministry. They are opportunities that require careful attention, cooperation, and adaptation. The board of St. Francis House seriously considered the possibility of abandoning our location, but we rejected that option, convinced that our location offered exciting opportunities for campus ministry that could not be met in any other way. Our decision to stay and our commitment to this development proposal is also a commitment to the neighborhood, a commitment to make it a vibrant and livable community for all of its residents and all those who work and worship in it. We don’t know what the future holds. We do know that the status quo cannot be maintained. We know that we must adapt to meet the changing needs of students, and the changing nature of our larger community. This development is our attempt to do just that, to create sustainable, exciting, adaptable ministry into the future. We look forward to working closely with our Lutheran neighbors to ensure the vitality of our ministries and our neighborhood. I urge you to support this proposal.